Rerum – old snake oil with a new name? This person has been the subject of inquiries over some of his unorthodox ideas. 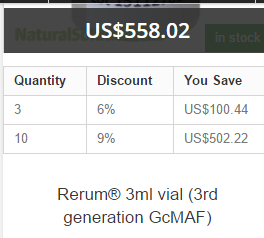 I am very much in favor of taking Vitamin D, Oleic acid — just not paying $600 for 3ml! This has the appearance of all hype with no evidence. He appears to have been forced to leave Italy, Switzerland, England and appears to be based in Arizona at the moment.